You may have noticed by now that the majority of the new fabric that comes into my life these days comes from Fabric Godmother. This is because I work for them from time to time, so have the opportunity to get up close and personal with their inventory, which is invariably both gorgeous excellent quality. After helping out at one of their recent open days, some of this denim jersey (pictured below) came home with me. Personally, I'm not sure if it makes more sense to call it a denim-look knit, or a stretch denim. 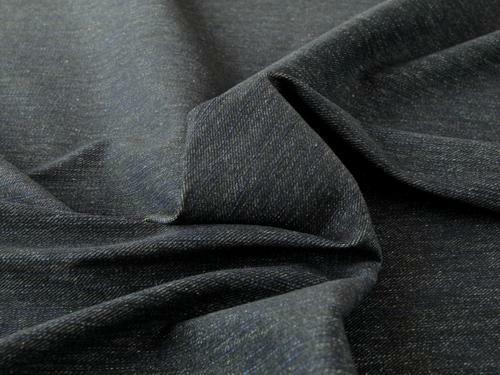 It looks like a woven denim, but has the four-way stretch properties of some kind of knit fabric. Either way, it looks amazing and is clearly going to be really comfortable to wear. A couple of months ago I made the (in hindsight foolish) decision to have another whirl at the True Bias Hudson pants pattern. I had a previous failed attempt at that pattern four years ago, which, I surmised, was a FAIL because I used a 2-way rather than 4-way stretch fabric. This denim-knit-whatever-you'd-call-it definitely fit the four-way stretch bill, and I had dreams of creating a cool and clever jogging/jeans hybrid that I'd never want to take off. Except that didn't happen and the whole thing became a massive FAIL. Possibly due to the thickness of this fabric and/or choosing the wrong size on the pattern, or whatevs. Now I've been burnt twice, I'm going to leave the Hudson pants pattern well alone going forwards, and stick to jeggings styles for my super comfy bottoms unless persuaded otherwise. Anyways once I realised the Hudsons were going to be a FAIL, I cut them up to reclaim the fabric from the front and back legs and the waistband piece. 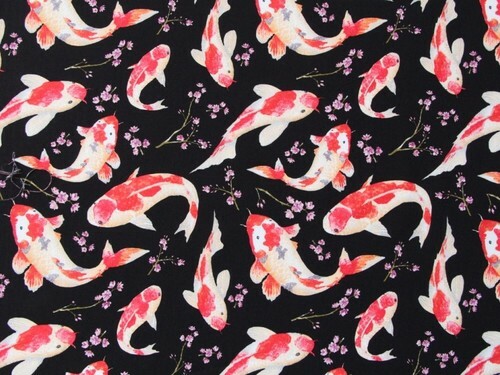 I then made the most of the MMMay celebration discount codes and bought an additional metre of this fabric so that I'd have enough for the Bibi pinafore project. 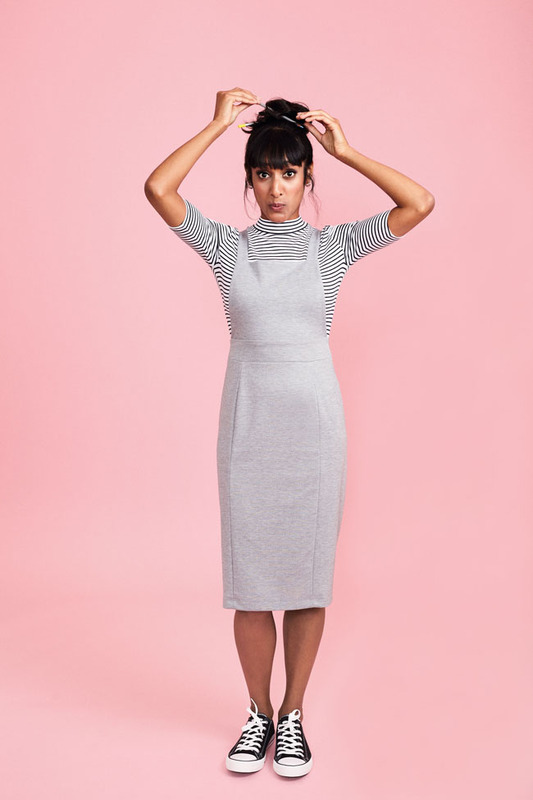 The Bibi skirt is really cleverly drafted, consisting of one main skirt panel piece that you cut out four of. Once stitched together, the skirt is worn on the body so there are no side seams at all. 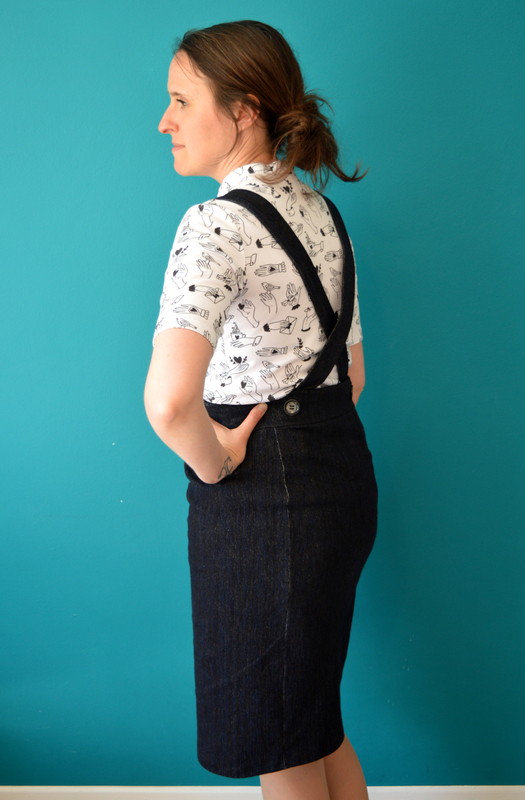 You also need two waistband pieces that are faced (plus two bibs and two straps if you plan to make the pinafore version). The reason I had to get rid of my stretch denim skirt during MMMay was because my waist measurement has grown a bit. Therefore, for the Bibi, I started out by tracing the size 5 at the waist grading down to the size 4 for the hips, and held off cutting out the waistband pieces until I could check the fit. I basted the skirt panels together (two of which I squeezed out of the back leg pieces of the failed Hudson pants) and a quick fitting showed that I could proceed with no further alterations needed. 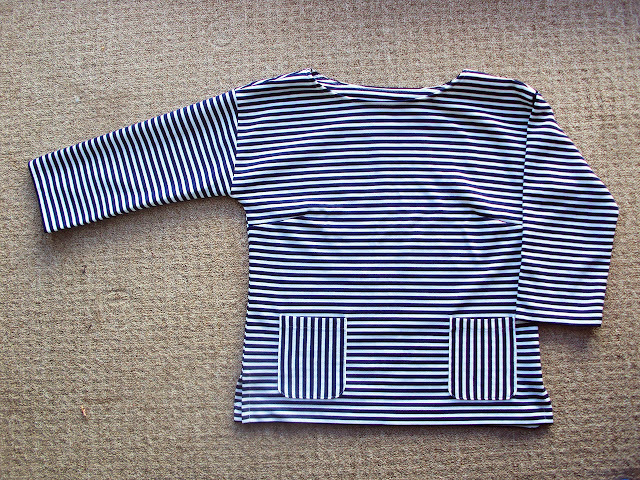 Because the denim knit is quite thick, I used some plain black cotton-lycra knit I'd recently bought from Girl Charlee to cut the waistband facings and the reverse of the bib section. Having stalked the #bibipinafore hashtag on Instagram, I'd seen than some people's versions gaped a little at the top edge of the bib. It seemed that most of those women were perhaps fuller busted and although I wasn't sure where I stand on that particular spectrum, just in case I decided to make the width of the top of my bib section slighter narrower (1cm each side) in an attempt to avoid any gaping. I also positioned my straps (which I've made about 1cm wider than the instructions in the book suggest, FYI) so that they joined the top of the bib at an angle rather than coming straight up so hopefully that would help too. 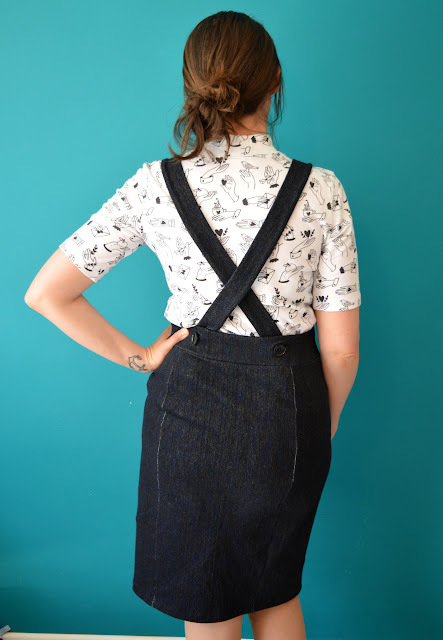 I'm very pleased with this pinafore! When wearing it (as I am now), I feel more put-together and more stylish than I usually do. It seems to hug my shape nicely, but the thickness of the fabric skims over much of the lumps and bumps. And the best of all? It's crazy comfy. If I had to pick metaphorical holes though, I'd flag up that the skirt seams show the white lycra content of the fabric more than I'd prefer, and the bib gapes a bit at the sides (but not at the top!). I love wearing it with my hands print Freya top, as I am in these pics, but I've decided I prefer it with trainers more than with these shoes for a more casual vibe. I'm looking forward to working out some outfits to wear it in cooler weather, and I can definitely see myself making the skirt pattern, if not the full on pinafore version, again in the future when the right fabric comes my way. I don’t mind doing a bit of selfless sewing when the mood strikes me. However, I don't throw my sewing skills around willy nilly. If I’ve made you a garment, or mended/altered anything for you, even if you paid me in food for something, then it means that you are VERY special to me. The first garment I made for Pat (Mr SoZo) was a western style shirt, created not long after we moved in together. After that, I vowed to make him one garment per year that we were together. However, the last garment I made for him (another crazy western shirt) was FIVE years ago, whilst I was pregnant with our daughter, and I must admit that I hadn’t made him a garment since. There just seemed so much sewing for this new small person (later, people), and for my new body and lifestyle, to do. Plus, I generally made him shirts that he’d wear to go out in the evening. And the new small people has meant that there's been very little going out in the evening in the last 4.5 years, so new shirts seemed a bit pointless. 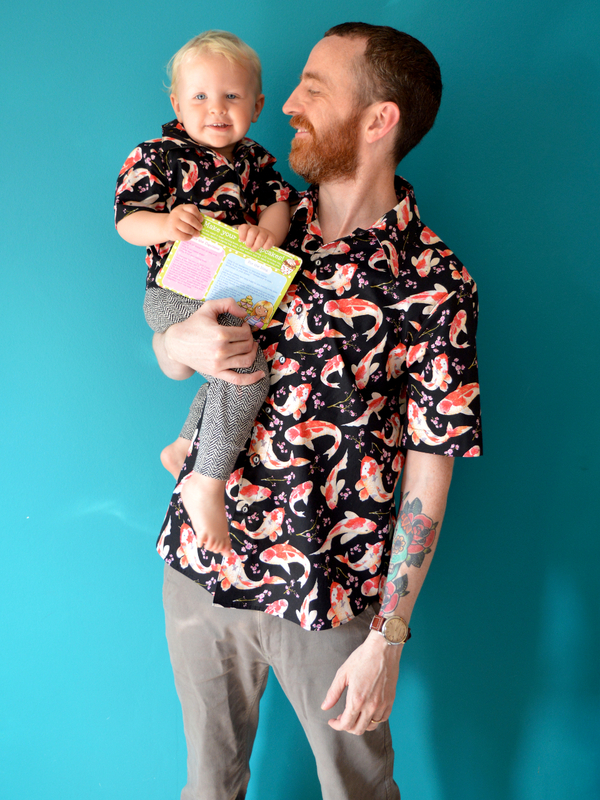 I felt a bit guilty about this complete transference of my creative energies away from him, but I assuaged that guilt by reminding myself that instead of some annual new shirts, I’d just made him some ACTUAL CHILDREN. 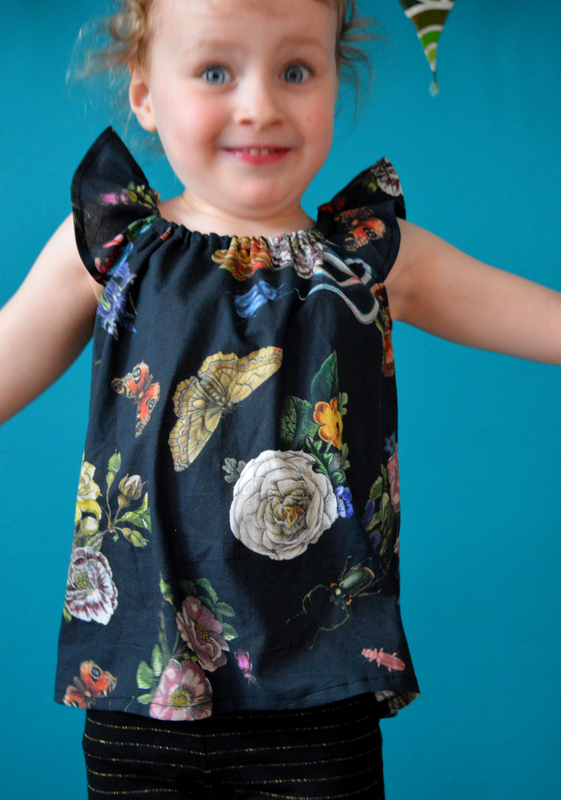 Then, this fabric came into my life, thanks to the generosity of Josie from Fabric Godmother. She very kindly gave me this fabric when I was struggling to justify buying all the pieces I wanted during one of their open days last year. Originally, I intended for it to become a jumpsuit to wear to my sister-in-law’s wedding last summer. But a toile of the proposed jumpsuit pattern taught me two important things: A), the pattern was going to require some major tweaking if it were to look flattering and provide sufficient coverage to hide my ugly old nursing bra, which I just didn’t have time for, and B), the fabric probably wouldn’t have worked very well for the style of pattern. 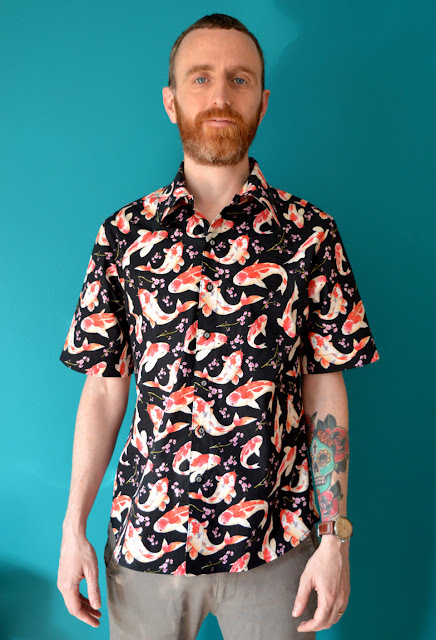 This koi print cotton poplin (also available with ivory, blue or jade backgrounds) has a similar weight and handle to a medium-weight quilting cotton. I rarely wear prints myself, but I know a good one when I see one. The print design is really detailed and has been created using some metallic inks so that parts of it have a subtle iridescence (no, I didn't spell that correctly first time). Because the original jumpsuit pattern was full length, I came away with 3m, which is nearly double the amount of fabric that I usually acquire when buying fabric (I usually make separates). Having that sizeable quantity of stunning, free fabric just sitting there dormant on my fabric shelf weighed heavily on me. I must have been refolding my fabrics (which I do with embarrassingly regularity) and Pat mentioned that it was cool. Before I even thought about what I was saying, I offered to make him a shirt out of it. The offer was met with a favourable (but probably skeptical!) response, and a plan was born. And thanks to the abundance of fabric, I was able to squeeze a mini version out of what was left over from Pat's! Probably the most successful, and certainly the most used, of the garments I’ve made Pat is this check, short-sleeved shirt, a tweaked version of Burdastyle's Jakob pattern. I used the exact same pattern pieces for this koi version, but turned the sleeve cuffs under instead of outward, and omitted the breast pockets because it looked like it would disrupt the print unnecessarily. Thankfully he seems to have changed size or shape very little in the last eight years, because the fit seems to me to be fine. Looking at these pictures, however, I'm wondering if the sleeves, in this slightly stiffer fabric at least, are a little full. I've got another shirt planned for him now, and I may make an adjustment to narrow them slightly, which should also have the beneficial effect of raising the height of the sleeve head. 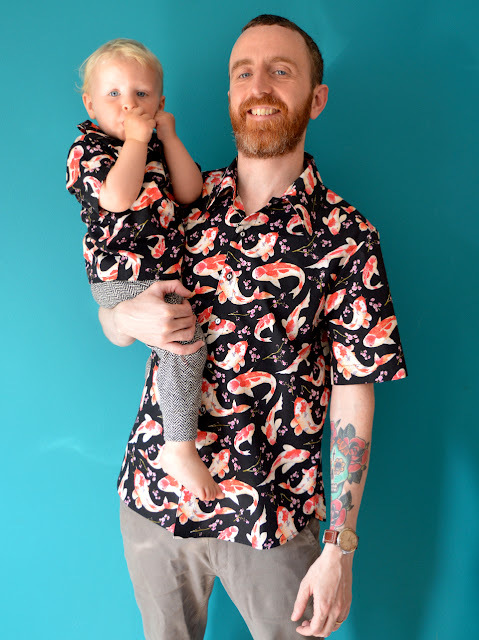 I made Frankie's shirt using Burda 9851 (which seems to be purchasable on eBay), the same pattern I used to make this comic book print version, made whilst he was still in utero. 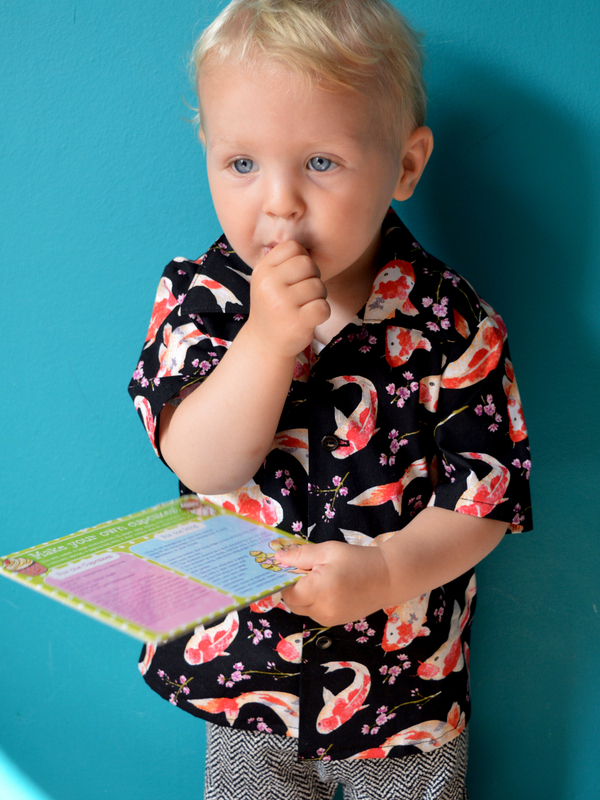 Thanks again to Catherine from Clothes and Sewing for giving me the pattern when her youngest son grew out of the size range. To make that comic book print one, I used the size 9 months pieces, however, currently at 20 months, he's only just starting to grow out of that one. For this koi print shirt, I went with the size 18 months pieces, and I think he should get at least a year's worth of wear from it. I made these shirts along side each other so that I would need to do less switching between the regular sewing machine and my overlocker. It was fun to see them progress at roughly the same rate, although the construction methods were somewhat different. And there's nothing like making two at a time to remind you just how much work making a button up shirt actually is! It's probably no surprise when I say that I love these shirts. I really benefitted from having a couple of successful TNT sewing patterns ready to reach for, so using this amazing fabric wasn't much of a gamble. It's been such a joy to make them for my boys, and hopefully they'll both get lots of wear from them, although perhaps not always at the same time! It's surprising to me that, having taken part in nine Me-Made-Mays now, I can come away each year with a whole lot of new knowledge and feelings towards my handmade wardrobe. In my last post I wrote about my feelings towards last month's challenge. Today I want to talk about the specific lessons I learnt about my wardrobe from taking part, and what I've done (or plan to do) about them. My body has definitely changed since I made a lot of my clothing. Growing and breastfeeding two babies, as well as entering my late 30s, means that my silhouette and measurements have changed in a way that cutting back on the magnums for a while probably won't reverse. There's nothing I can do about it, and last month's challenge forced me to notice that some items really weren't working anymore. Both my plain black and stretch denim knit skirts were made when my waist was smaller and therefore the curve between my waist and hips was more, umm, curved. I tried altering both by lowering the waistlines, but it only really worked on the black one. The denim one has now gone to my mum to see if she can make use from it, and I've set to work making an updated alternative using Tilly's Bibi skirt pattern (pinafore version!) 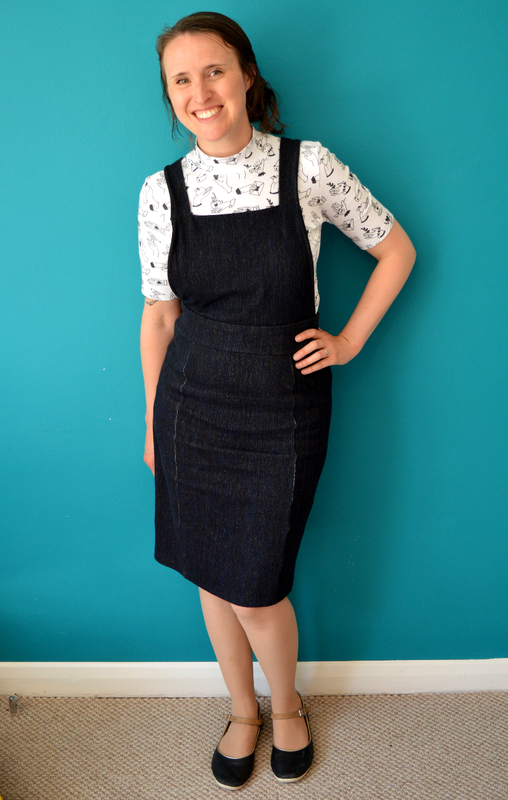 in this denim knit (pictured below) from Fabric Godmother. 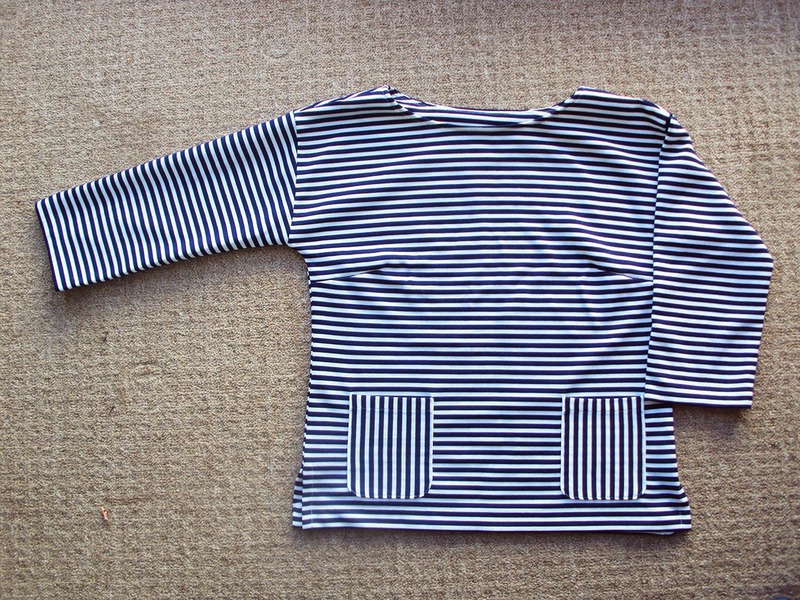 Last month's challenge also made me admit that I had stopped feeling great in my 1960's Breton top (pictured below). I still adore the style of this garment and consider it the best garment I've ever made, but it was starting to look a little snug around the waist in a way that did suit the boxy style. I held my breath as I took my seam ripper to it, and successfully managed to claw back some width from the side seam allowance. Phew! It now looks a lot better and I feel good in it again. 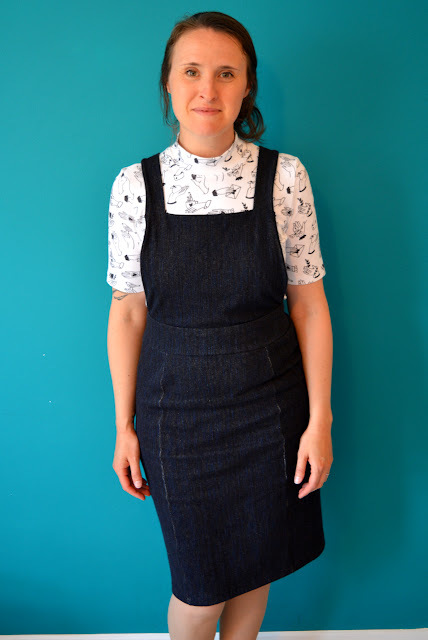 I've had to say goodbye to my grey Tova tunic, and my denim Tova top (pictured below) has set aside for allotment wear when I finally get one. My amazing anchor Luna pants are developing holes on the knees and bum (I think the little anchor have been created using some kind bleach-like colour removal technique rather than by printing, making the anchor shapes thinner and more susceptible to wear) and have been relegated to 'lounging around the flat' wear. Close-fitting knit tops. I had started to veer away from my closer fitting jersey tops (like my Bronte tops and Agnes tops) because I've been feeling more self-conscious about my waist (and the previously mentioned lack of non-jeggings trouser styles), but they've been given a new role for layering under the aforementioned pinafore and dunagrees. A lined jacket. There's a bit of gap between my wool cocoon coat and my unlined La Trop Facile jacket where I wish some kind of lined jacket lived. On those inbetweeny days, I find myself wearing a weird selection of layered items that neither looks good, nor feels very comfortable. I do have my lined Woodland stroll cape, but I find that its colours limit the outfits that it works with, plus it looks a bit wintery for spring/summer wear. I've yet to find the right jacket pattern, but I have 2m of gorgeous off-white/navy striped double knit in my stash that might work for a casual jacket. My eyes are peeled for a pattern to fall in love with. Trousers that aren't jeggings. All my trousers, aside from my one functioning pair of Luna pants, which are really only for very warm weather, are a tight jeggings style. I LOVE my three pairs of jeggings, but I don't like them with my tighter or shorter tops. So I made the most of the Me-Made-May celebratory discount codes and treated myself to the True Bias Lander pants pattern plus fly front extension pack. That pattern has been on my #2018makenine list for months anyway, and last month showed me how useful they will hopefully be. Sleeveless tops. After an exhaustive online comparison of the Grainline patterns Willow tank, Wiksten tank and Made by Rae's Gemma tank, I bought the Gemma pattern and have begun the surprisingly long journey towards getting a fantastic fit. So far I'm four toiles in and there's still further alterations to be made. It's going to be worth it though, to have near-perfect woven tank pattern to reach for. Shorts. At the end of last summer, I returned to Pattern Runway's Sweet shorts pattern and made a lovely navy pair, having made a denim pair previously that ended up being way too big. Annoyingly, that navy pair DO NOT fit me now, but fortunately (?) the denim ones now do! But I don't think one pair of shorts is enough as it can get pretty warm during the summer in the South of England. I've made an initial (two sizes too big!) toile of the Deer and Doe Chataigne shorts pattern, which I've had in my stash for a number of years. I'm also thinking about making a pair of Lander shorts as a way to test the fit of that pattern before I embark on a full length version. Warm tops. My lack of warm tops wasn't really highlighted during May, but it's a perpetual issue in my wardrobe that I thought I'd chuck on to the list here. After the success of my lovely anchor ponte Freya top, I'd like to make another in black ponte and I'll keep my eye out for other suitable sweater knits. It's a great item for layering with vests underneath and cardigans on top. I've also got plans to draft a great sweatshirt patterns, and I might even try out the Sew House 7 toaster sweater pattern than appears so much on the interwebs. Exercise wear. Recently, I made a commitment to myself to exercise more by going jogging and maybe yoga. I've been out jogging a couple of times of late, but my exercise wear is embarrassingly early 2000's RTW, and it does little for my motivation to get changed into it and get out there and run. I bought some plain black cotton/spandex jersey from Girl Charlee using the recent discount code (which I've used previously and loved the quality) with vague plans to make some leggings. I know that a couple of great-looking books in sewing active wear have recently been published, but I'm not at that level yet! Phew! Now that I look back at this post, that looks like a lot of lessons I got to take on board! If you took part, what type of garments or specific patterns are now on your to-make list? My goodness, what a month!!! Today I'm going to share the last handful of outfits from my personal Me-Made-May challenge and share some thoughts on MMMay as a whole. Then I'll post again in the week in more detail about the lessons I took away and what I plan to do about them. So, wow. Last month was fantastic: I got what I was hoping to gain from my personal pledge, and so much more, which I'll write about in more detail soon. And, more broadly, I found the community aspect of MMMay this year was utterly amazing. More so than ever before, it felt like a party for the online sewing community, where we celebrated all that is awesome about what we are and what we do. I'm certain that a greater number of people participated than ever before, and in part thanks to the exposure MMMay got via the Love to Sew podcast, Sewcialists MMMay-related blog posts, and other well known sewing related businesses sharing blog posts, newsletters, Instagram stories and whatever else, the real aim of this challenge (to improve your relationship with your handmade wardrobe, and NOT just a photo challenge) seemed to be much clearer and at the forefront this year than previous years. And with so many participants sharing their thoughts and the lessons they've learnt from taking part, it has made it even easier to reflect on our own journeys towards a successful handmade wardrobe and the relationship we hope to have with our creativity, and even our own bodies. I have yet to start pouring over the blog posts that start to appear as the month draws to a close, where participants summarise and reflect on their challenges, but reading all that I can on Instagram has been so fun and really touching. All the fantastic outfits that have been shared have left me (and I know for sure many, many others) with mountains of inspiration of where I want to go with my own personal style in the future. And getting to peek into the daily lives of others all around the world have been fascinating and felt truly connecting. I'm at a bit of a turning point in my life at the moment; I am starting to see in the vague future a time where my children won't need me quite so much (my daughter is starting school this September, wah!!!). I can imagine I will have more time and headspace to figure out how I can bring in money, how I want to spend our free time, and who I want to turn into as I stare down the barrel at my 40s (I'm currently 38). This year's challenge helped me to realise that I am well on the way towards the kind of wardrobe that will dress me well and take me in some of the directions that I think I want to go. Clothes have always represented to me an exploration into, and a reflection of, the different ways I can live my life and aspects I can incorporate. And thanks to #MMMay18, I now have lots more ideas of other avenues I may want to explore. If you took part, I hope you had an illuminating month and lots of fun, whether you were involved in the community aspect, or simply through playing about with and rediscovering your handmade wardrobe. If you do write a blog post summarising your thoughts and discoveries, I'd love to read it so please leave me link to it so I can visit! 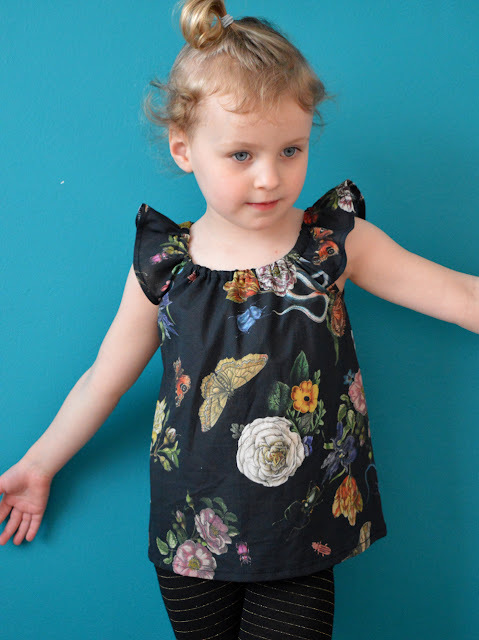 Today I'm featuring a couple of free sewing patterns for children that didn't feature in 'My Favourite Free Children's Sewing Patterns' post. 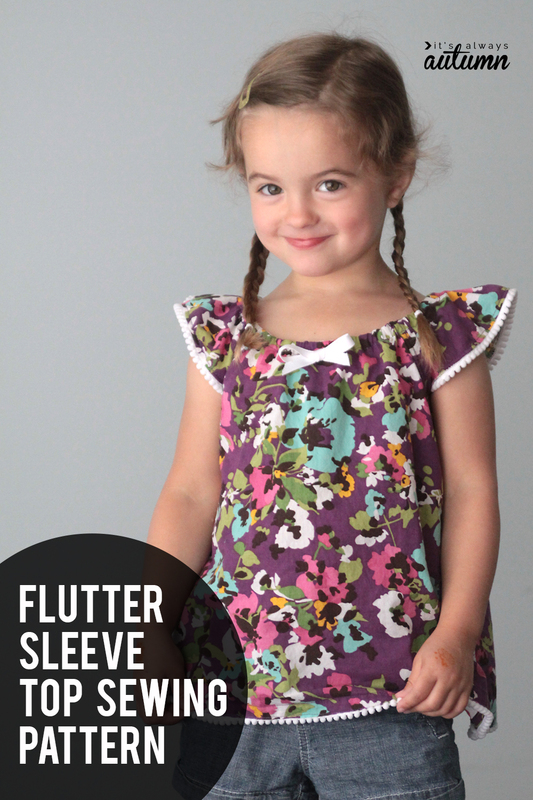 The reason for this is that these patterns (the flutter sleeve dress and top and romper patterns by It's Always Autumn) are only for size 4T (or actually smaller, but more on that in a bit). I'm putting this info at the top of this post here because if you're sewing for bigger or much smaller kids, I'm afraid this post may not be of use to you. Many thanks to Autumn for making these patterns and tutorials available for us to use for free. 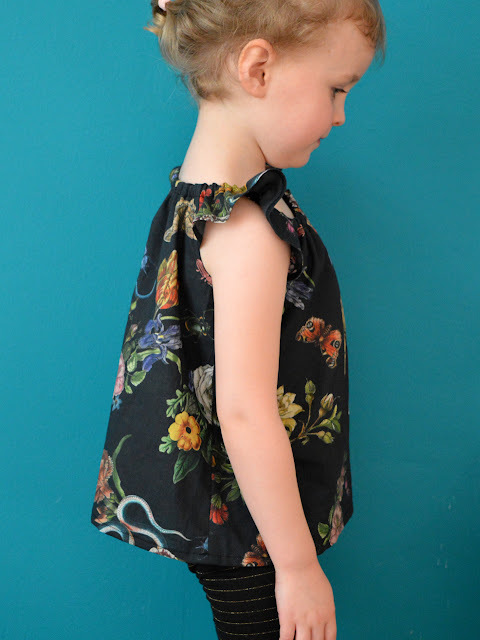 The top and dress pattern makes a simple 'peasant' style garment with elasticated neckline using just two patterns pieces (the front/back and the sleeve). The romper pattern is slightly more complicated with a shorts section added at the waist with another elastic casing. As stated above, these patterns have been drafted for 4T. No indication has been given about what body measurements this correlates to, however there is an explanation that the pattern is drafted for her daughter who, although 3.5 years old, wears size 4 store bought clothes but is petite. Because of the style ease that's built into a top or dress like this, that pattern would probably be suitable for a variety of interpretations of 4T! 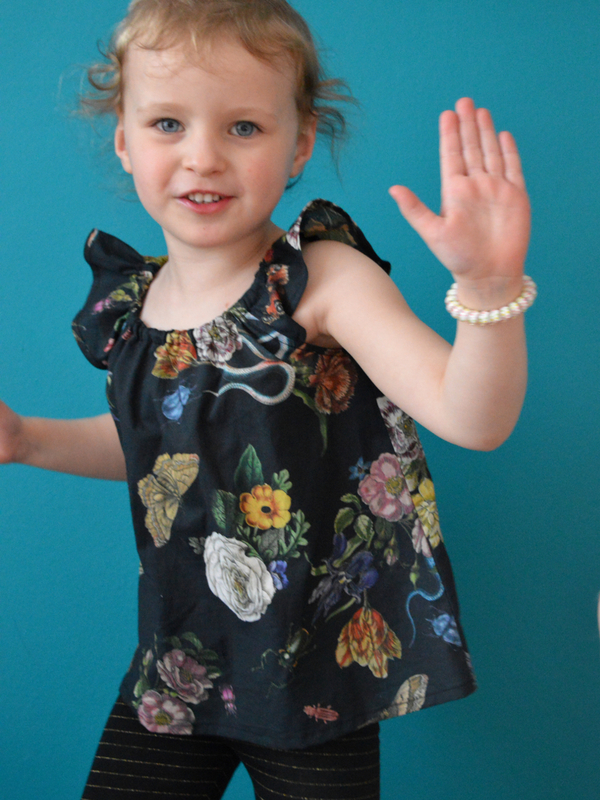 My current interpretation of a 4T daughter (aged 4.5, fairly tall and slim-to-average build) fits this top well. However, if I were to make the dress version, I'd measure the length of the pattern piece before going ahead, or I'd err on the side of caution and add extra length straight away. Spurred on by the success of the top, I rushed to print and cut out the romper pattern. Because the proportions of little girl photographed looked different to my daughter's, I added 1.5cm to the lower edge of the front and back pieces that form the top half. Sadly, when Dolores tried it on, it was wayyyy too small, particularly the shorts section, so I donated it to a friend with a 3yo daughter. 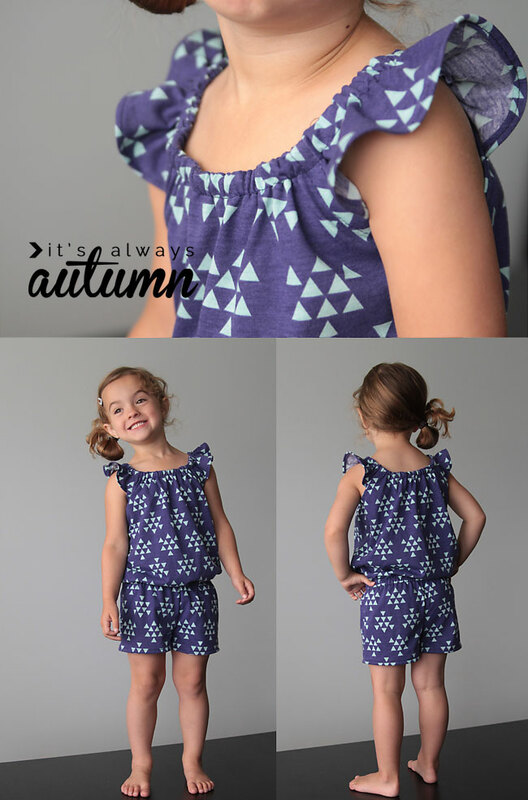 Therefore, I'd say that the romper pattern would suit a three year old, or very small four year old. Which is basically the age that the pattern designer said it was drafted for, so I shouldn't have been surprised when it didn't fit Dolores! There isn't any suggestion for what type of fabric to use for the top/dress pattern, or how much you'll need, but I'd say a light-to-medium weight woven cotton, or even something more slinky like a viscose, would work well. Here I used the leftovers from my Cobra Corsage Luna pants, which is basically a cotton lawn. Cotton lawn is light-weight but a dream to work with; it responds well to pressing yet doesn't crease too horrendously. This pattern is a great scrap buster, so have a hunt through your leftovers to see what you might be able to use. I wouldn't recommend anything thicker than a lighter-weight quilting cotton though. Knit fabric could also be used (see next paragraph). 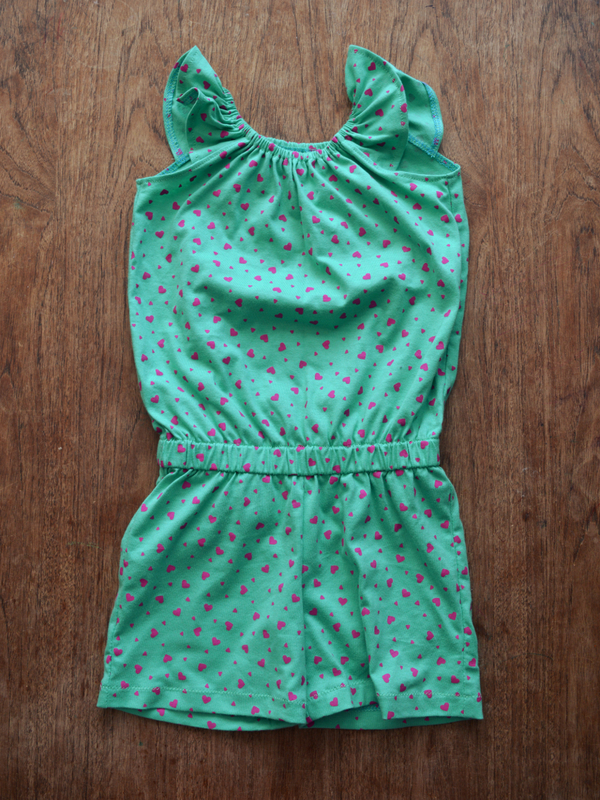 For the romper, it is specified that knit fabric be used so it can be pulled on and off with ease. I'd say that single jersey or anything t-shirt weight would be best. I used a piece of 100% jersey (no elastane/lycra/spandex content) from my stash that didn't have very much stretch, and despite the garment not fitting, I could tell that the fabric would have worked fine. The patterns are very simple without much info included on the pieces (no grain lines, notches or seam allowance reminder), but I really liked how they only required a few sheets of paper and about three seconds to cut out! I also found the shorts part of the romper pattern really clever. The front and back pieces are formed from the same pattern piece, but you cut away a section at the top when cutting the front pieces which shortens the rise. This saves time, paper and printer ink. The construction steps are written in the form of a tutorial in a blog post. I actually really like this (as opposed to a separate PDF for example) because I can follow along on my phone which is propped up next to my sewing machine, and I don't have to get out my laptop. The instructions are very basic, but most of the steps are illustrated by a clear photo, so I doubt it would be too challenging for anyone with a bit of sewing experience. I would have liked the construction steps to be numbered though, so you could find where you had got up to more quickly. What did annoy me, if I'm honest, is the amount of adverts on this blog. I know this is a really tricky subject because, after all, this designer has very kindly offered a number of patterns (and therefore masses of her time and effort) for free, and obviously I know that we all have to make money to put food on the table etc, but I found the adverts (some being animated gifs) that appear at the top, side, bottom AND in amongst the content of the actual posts, to be really distracting. It's kind of ironic that I mention this topic today, because I also received a comment from a reader recently that didn't like an advert in the side bar of my blog. Sadly, a couple of adverts, the content of which I have no say over, is the price I have to pay for the free blogger blog hosting, and I receive no revenue whatsoever from those two ads. I don't know for sure, but I'm pretty sure the ads on the It's Always Autumn blog are the revenue generating type. But like I say, we all have to eat, and it's totally your right to stick whatever you damn well like up on your blog, especially if you're offering content for free . That said, I personally found that using these tutorials with the ads, combined with the lack of numbers for the construction steps, made trying to follow the construction process not very pleasant. But on to the finished garments. The top, I'm thrilled with. I didn't apply any trim as I felt the fabric I was using was busy enough, however applying trim is included in the instructions if you would like help in doing that. for the knit romper, you could cheat like I did and overlock/serge the top raw edge them turn over and stitch to make an elastic casing more quickly than applying bias binding. for the romper you could use contrasting fabric for the top half and the shorts half, creating the illusion of wearing separates. I'm totally in love with this little top, and if the need for another short-sleeved top or dress became evident in Dolores's wardrobe, I'd definitely consider reaching for this pattern again. However, because it's a single size, if she doesn't require such a garment again very soon, I probably won't end up using it again. I wish I'd found these patterns last spring/summer now.